GENEVA, Switzerland – Wayne Simmonds (Scarborough, Ont./Philadelphia, NHL) and Claude Giroux (Hearst, Ont./Philadelphia, NHL) had a goal and an assist apiece, helping Canada’s National Men’s Team to a 4-1 win over Switzerland on Tuesday in exhibition action ahead of the 2017 IIHF World Championship. 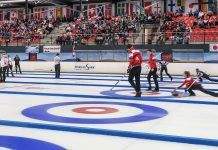 It was the lone pre-tournament game for the Canadians, who are two-time defending world champions. Canada struck quickly to take control, scoring twice before the six-minute mark of the first period. Chris Lee (MacTier, Ont./Metallurg Magnitogorsk, KHL) opened the scoring at 4:16, beating Swiss goaltender Leonardo Genoni from the slot, and Sean Couturier (Bathurst, N.B./Philadelphia, NHL) doubled the lead at 5:42, getting his shot past Genoni from a sharp angle. The offensive onslaught continued from the Canadians with Giroux scoring unassisted to make it 3-0 just part the 13-minute mark, before Pius Suter poked a rebound past Canadian netminder Chad Johnson (Calgary, Alta./Calgary, NHL) late in the first period to make it a two-goal game after 20 minutes. Canada kept it coming in the second period, but Genoni was there to keep his team within striking distance; the Swiss puck-stopper finished with 37 saves, and stopped 29 of 30 in the final two periods. Simmonds capped the scoring with less than four minutes to go in the middle frame, finishing on the power play; Jeff Skinner (Toronto, Ont./Carolina, NHL) and Giroux earned the helpers on the 4-1 goal. The Canadian pressure continued in the third but Genoni was perfect on 15 chances in the final stanza, keeping the final margin of victory at three. Johnston stopped nine of the 10 shots he faced in just over 29 minutes of work before giving way to Calvin Pickard (Winnipeg, Man./Colorado, NHL), who turned aside all seven shots directed his way. Canada finished with a 41-17 advantage in shots on goal. It heads now to Paris, where it will open defence of its gold medal Friday against the Czech Republic (2:15 p.m. ET/11 a.m. PT) in the Group B curtain-raiser for both at the world championship.